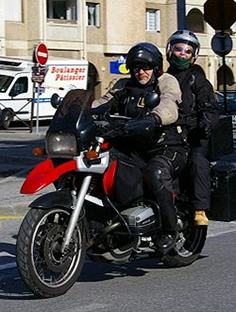 At the last Motorcycle Working Group Meeting (MCWG) on December 14th 2011, the European Commission presented their views regarding extreme “Chopper” style vehicles which mainly concern national and individual approval purposes. For the UK this would be the Motorcycle Single Vehicle Approval (MSVA). 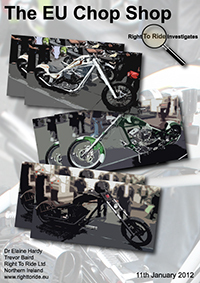 Extreme “Chopper” style brings to mind motorcycles with long forks, stretched frames, high handle bars, modified from an original motorcycle design or built from scratch. For the general non-motorcycle public the easiest explanation is the Stars & Stripes-adorned fuel tank of the bike used in the 1969 film Easy Rider which with developments and pushing the boundaries in motorcycle customising may not be seen as so extreme by today’s standards even from the motorcycle manufacturers “standard” bikes. 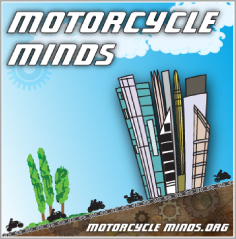 We wrote to both the Commission for clarification and to ACEM (the European Motorcycle Manufacturers Association) and have received a response from both. The Commission representative responded that, “As the title of the MCWG paper says, it is a discussion paper and concept design for the RVFSR – Regulation on vehicle functional safety requirements on the vehicle functional safety requirements. The Motorcycle Industry’s perspective was that they intend to put forward a proposal to the Commission regarding this issue. We await ACEM’s submission to this proposal, but at Right To Ride, we believe that the ride-ability test proposed by the Commission, which would include a slalom and U turn test, is not within the remit of the “Technical” regulations and therefore should be abandoned, because this would already be covered under the General Product Safety Directive. The objective of this proposal appears to focus specifically on mainstream manufacturers and not unique builds or small series which would remain under member state single vehicle approval. Some main stream manufacturers of these styles come to mind, specifically the models such as the Honda Fury, Victory Jackpot and Harley Davidson Wide Glide. However what has not been made clear are what exactly the technical aspects are. The response from the Commission has in part clarified that it is not specifically focussing on long fork Choppers, but appears to use Choppers as an extreme example.